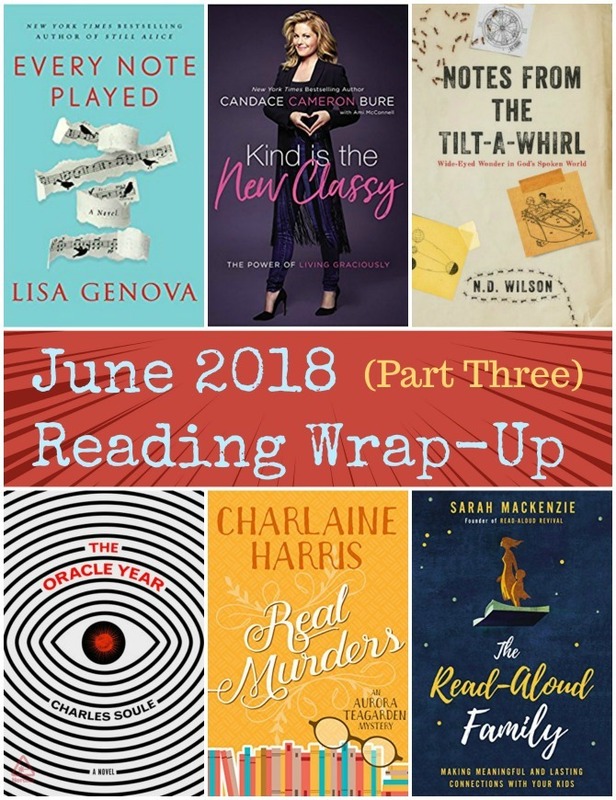 As promised, I’m back today with the third and final installment of this month’s quickie book reviews. (You can find part one here and part two here.) This batch is split evenly between fiction and nonfiction, and my opinions were as diverse as the books themselves. 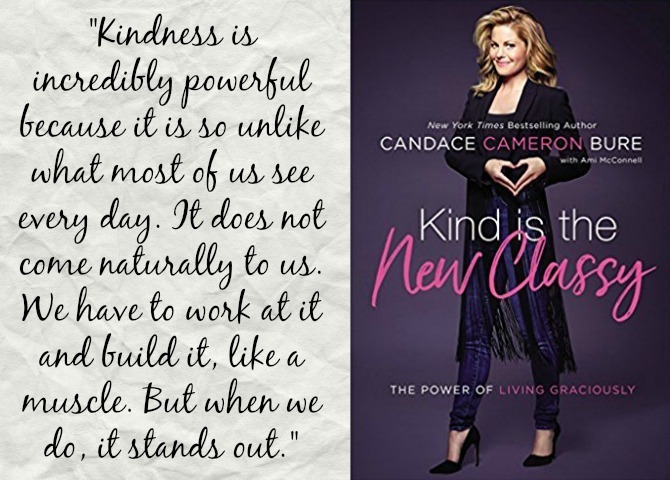 Kind is the New Classy: The Power of Living Graciously, by Candace Cameron Bure: I didn’t grow up watching Full House, so Candace Cameron Bure wasn’t really on my radar until the last couple of years, during her time on The View. The daytime show often aligns with my workout time, so it’s frequently on the TVs when I’m at the gym, and through my occasional glimpses up at the screen, I could tell that Candace was unique. As a Christian and a Conservative, she rarely agreed with her cohosts; but she was never afraid to stand by her convictions, and she did so with such grace and respect. I got to “know” Candace better when we began watching Fuller House last year; she is easily my favorite character on the show, and her portrayal of DJ seemed so genuine that I assumed she was just as wonderful as the mom she was playing on TV. I started following her on Instagram, and my assumption was confirmed: true, social media can be misleading, but at a distance Candace did seem to be the Real Deal. So I was incredibly excited to read her latest book about the quality that has drawn me (and many other fans) to her: kindness. Kind Is the New Classy isn’t your typical celebrity memoir. Candace does share parts of her story, including her faith testimony, her time away from her acting career to stay home with her kids, and the dynamics of her current job. But mostly, this is a book about being kind—how Candace practices kindness, and how we can, too. Candace’s faith is the driving factor in this book; I was impressed by her knowledge of Scripture and her ability to implement her beliefs in her daily life. She demonstrates that it is possible to be a “nice girl” in Hollywood, and her practical advice on genuine kindness is attainable for the average reader, too. Kindness is at the core of every chapter, but this book goes beyond the basics of good manners and random acts of kindness. Candace shares how she’s infused her entire life with kindness, from her career to her relationships to personal self care. I especially appreciated her thoughts on ambition and purpose, and how these things are rooted in kindness rather than selfishness. I came away from this book fully agreeing with Candace that Kindness IS the new classy. I also believe that Candace is truly a Class Act, and one I admire. 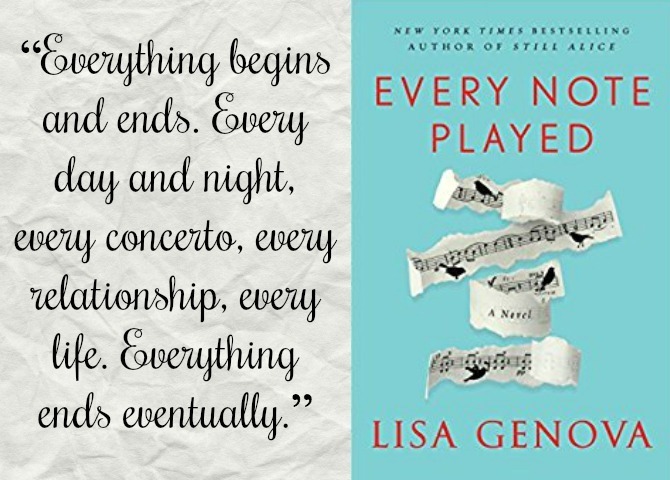 Every Note Played, by Lisa Genova: Richard was once an accomplished pianist whose talents wowed audiences all over the world, and whose womanizing led his wife Karina to leave him three years ago. Richard’s career (as well as his philandering) comes to an abrupt halt when he becomes paralyzed by ALS. When Karina learns of Richard’s illness, and his lack of anyone to care for him, she reluctantly moves him back into her home and becomes his full-time caregiver. As Richard’s body dies a slow death, Karina’s own dreams of pursuing a musical career begin to die as well. Lisa Genova is one of my favorite authors (she’s best known for Still Alice, but Love Anthony is my personal favorite), but this book didn’t resonate with me as her others have. Every Note Played paints a realistic and painful portrait of ALS, giving readers a window into the devastating effects of this disease on both the sufferer and his loved ones. The book also raises important questions about the value of human life, the preservation of dignity, and the ethics involved in terminal illness. These are heartbreaking issues, but ones that need to be explored, and fiction is a great avenue for jumpstarting these conversations. Unfortunately, the story itself is lacking and the characters are flat and not particularly likable. The writing is poignant and beautiful, especially the descriptions of music and its role in the protagonists’ lives, but Genova doesn’t seem to connect with the subject of ALS as much as she did with the diseases highlighted in her other books. 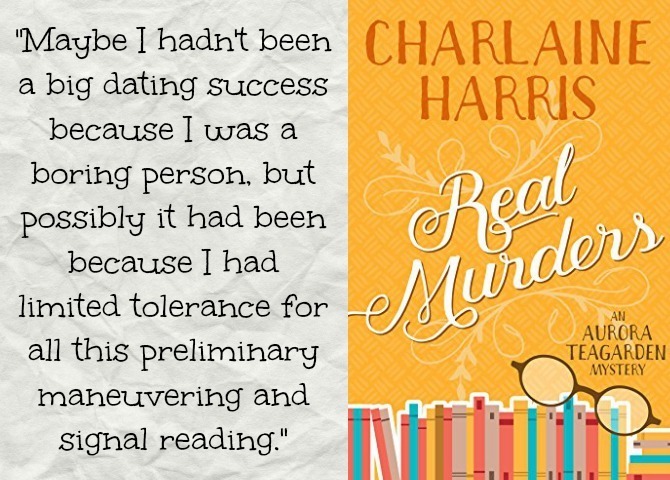 Real Murders, by Charlaine Harris: This series of cozy mysteries came to my attention thanks to Candace Cameron Bure’s book, in which she mentioned playing the protagonist in the Hallmark remakes of the books. A mystery featuring a young librarian as an accidental sleuth sounded like the perfect fit for me, so I immediately downloaded the first book in the series. Aurora Tiergarten is a small town librarian with an interest in true crime. Each month Aurora gathers with the other members of the Real Murders Society to discuss past cases. But murder becomes more than a passing interest when Aurora discovers the body of a Society member on the night when the group is scheduled to meet. Aurora immediately recognizes that the murder resembles one of the cases the club has studied. When the killer strikes again—and once again replicates another Real Crime—it becomes obvious that Aurora and the other members of the Society are being targeted. . . likely by one of their own. This is a quick, fun mystery (if “fun” can be used to describe a novel about murder). Aurora is an amusing and likable protagonist and I enjoyed the small town setting. This novel was published in 1990, and it was interesting to see how different the genre was three decades ago: the plot is much more straightforward (and clean) than today’s psychological thrillers, the characters are less developed, the mystery is fairly simple. Still, this was an enjoyable read and I’ll likely read more of the series. I would also love to see the television remake—I’m hoping it comes to Netflix! The Read-Aloud Family: Making Meaningful and Lasting Connections With Your Kids, by Sarah Mackenzie: As you’ve likely surmised, I’m a huge proponent of reading aloud. Some of my most treasured childhood memories revolve around family reading experiences (which continued through my college years), and reading aloud was something I grew even more passionate about during my time as a teacher. Now that I have a child of my own, shared reading is my absolute favorite part of my job as a mom. It was this passion that drew me to the Read-Aloud Revival podcast (I’d found my tribe! ), and I snatched up the host Sarah’s book the minute it released. 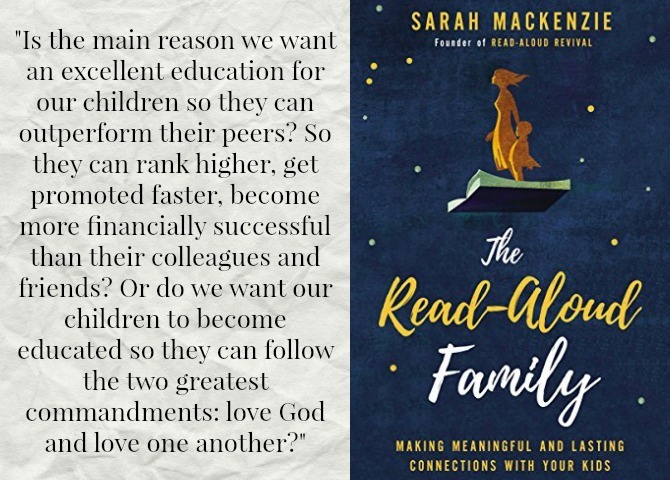 Read-Aloud Family is Sarah Mackenzie’s love letter to reading aloud, and it’s a beautiful letter indeed. The book is divided into three parts: Part One advocates for reading aloud, sharing statistics and anecdotal evidence for its effectiveness in strengthening parent/child bonds, promoting academic success, and helping kids become compassionate, purpose-driven individuals. Part Two delves into the HOW of becoming a read-aloud family, from creating a book-centered culture to overcoming barriers and making the most of our reading time. Part Three contains annotated lists of age-specific book recommendations. I enjoyed everything about this book. 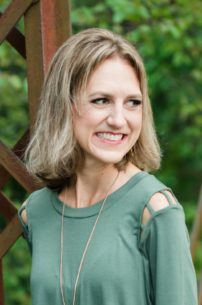 Sarah’s passion for books as well as for her children radiates within every story, idea, and suggestion. Her enthusiasm for her subject made me even more excited about being a read-aloud family ourselves. I especially appreciated her specific book suggestions, many of which were new to me. I heartily recommend this book to every family, whether you’re just dipping your toes into reading aloud or are already immersed in read-aloud culture. 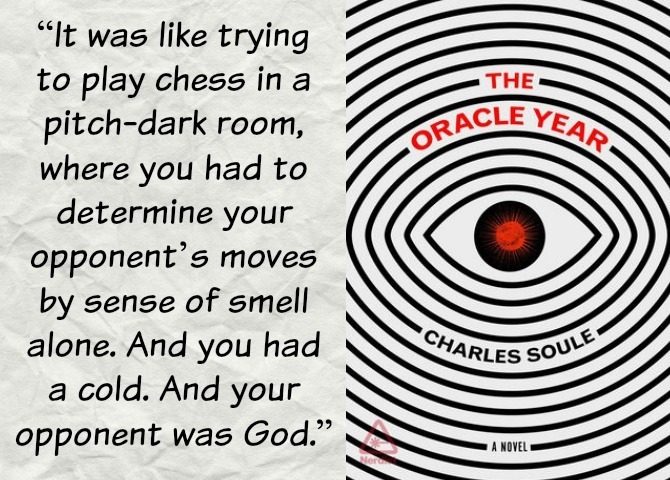 The Oracle Year, by Charles Soule: When twenty-something musician Will Dando awakens from a dream one morning with 108 predictions for the future seared into his brain, his life and the future of the world are forever changed. Some of the predictions are small, others have global implications. Will calls himself The Oracle and sets up a website to selectively announce his revelations. Soon he is the most powerful man in the world. As the site gains attention, he receives countless requests for his insight from just about everyone: individuals looking for answers about their future, up to global corporations who offer millions of dollars for his predictions. Will also gains a number of enemies, including the president of the United States, a popular televangelist, and more than one assassin. His only allies are his two best friends who help him manage the site, and the journalist who is willing to help Will share the truth. I really wanted to love this book. The premise is fantastic, offering the opportunity to explore themes of free will, the power of knowledge, and the morality of keeping and sharing information. Sadly, the book was much less philosophical or literary than I hoped it would be. I saw a few reviewers describe this novel as “Dude Lit” (a male alternative to Chick Lit) and I would consider that an accurate description. It’s fast-paced and action-heavy, with plenty of awkward dialogue and little character development or deeper reflection. I would have enjoyed this much more on screen than on the page. 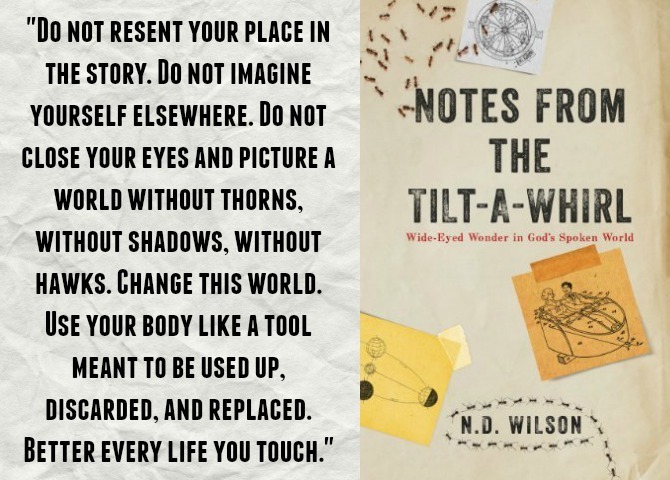 Notes From the Tilt-a-Whirl, by N.D. Wilson: How do I begin to describe this book? It is part theological treatise, part absurdist poetry, part philosophical exploration—and all parts quite brilliant. I’ve been a fan of N.D. Wilson for a while (since reading his 100 Cupboards, and hearing him on many podcasts) and the book had been lingering on my TBR for at least a couple of years. I was finally prompted to read it when our community group did a video series that correlates with the book. Not many members of our group enjoyed the series (Luke and I were the exception), but it sparked some incredible discussion, and I was eager to dig deeper into the book itself. And I’ve never read anything quite like it! Wilson’s writing is artistic, creative, and very tilt-a-whirly-ish; the book certainly earned its name. Through poetic musings and stream-of-consciousness storytelling, Wilson examines God’s creation and what our beautiful, terrible, incomprehensible World says about the One who designed it. He explores the questions of evil and pain, and how they can possibly exist alongside a beneficent Creator. And he comes to some very uncomfortable but scripturally sound conclusions. Ultimately, he pays homage and respect to a God who is much grander than our small minds could ever comprehend. As a piece of art, and as a launching point for deeper thought and discussion, this book is brilliant. Wilson has a unique mind that is equally artistic and science-based, a faith that is driven by facts as well as mysticism. Notes from a Tilt-a-Whirl manages to capture all of it. Negative tone notwithstanding, this is a must-read for Christians seeking a unique perspective on absolute truth.